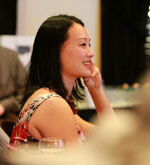 Julia Shih, Director of Strategic Alliances at AMAX, in Fremont, California, USA, received the Gold Stevie® Award for Female Executive of the Year – Business Services in the 2012 Stevie Awards for Women in Business, the world's premier awards for women executives, entrepreneurs, and the organizations they run. (July 24 is the early-bird deadline for the 2013 awards. If you haven't already done so, you can request an entry kit here and it will be emailed to you right away.) Here we look at how Julia is changing tech branding. Julia Shih has been described as part drill sergeant, part cruise director, and all heart. As Director of Strategic Alliances at AMAX, her passion for the company’s growth and well-being is contagious. She is a strong believer in a healthy work/play balance, a management that truly cares, and a system that focuses on each person’s potential instead of fixed roles. This encourages AMAX team members to feel that they are truly a part of something. Julia is a visionary leader who brings out her team’s highest potential and who allows them to showcase their unique personalities. She makes it easy for people to get behind her for a common goal. The core business of AMAX has always been OEM Server Manufacturing, so its brand has always been hidden behind that of customers such as McAfee, Riverbed, Cisco—some of the best-recognized names in the industry. As a result, most people had never heard of AMAX, despite it being an award-winning x86 hardware manufacturer with 30 years in the industry. When Julia Shih joined AMAX in 2010 she was given the challenging task of being the key handler of the AMAX brand. Her objective was not only to develop and market the new AMAX-branded product lines of servers, storage, and big data solutions to industries, but also to have AMAX’s name stand out amongst household Tier 1 competitors such as Dell, HP, and IBM. The key was to create memorable marketing initiatives that served a very focused purpose: to get AMAX’s name out there and to generate revenue through viral campaigns that would create brand recognition, core-competency/product recognition, and ultimately brand appreciation for one of the industry’s best-kept secrets. Other initiatives included passing out pints of beer—with the catchphrase: "That's a SWEET Rack! "—in exchange for seeing product demos to promote AMAX's rack server solutions; and a Big Data Haiku contest which raised Facebook likes by over 1100% in a matter of weeks. The press release alone received 900 views within the first 12 hours, went viral on social media, and was picked up by bloggers the next day. Perhaps one of Julia’s most successful initiatives was the creation of Ballapalooza, an industry basketball tournament benefiting Autism Speaks. The tournament brought key members of the tech industry together in a one-of-a-kind networking event. Working on the theory that those who play together are more likely to do business together, the tournament’s format placed players on teams according to both skill level and professional fit. The event not only generated a surprising amount for the charity: it also increased business, deepened relationships, and allowed employees within the same companies to bond and to improve work relationships. Julia’s strategic campaigns for product launches—including the PHAT Data Hadoop Cluster—increased total sales inquiries by over 640% and led to an increased company revenue of $26 million in 2011, most of which was from AMAX-branded solutions. Julia Shih has always thought outside of the box. She started her career in the film industry, and so brings a refreshing, dynamic, and creative perspective to the work she is now doing in the tech industry. As AMAX’s Director of Strategic Alliance, Julia is the key handler of AMAX’s brand as it touches sales, marketing, and client/vendor partnerships. She utilizes a Hollywood deal-making mentality to build symbiotic relationships with leading technology partners to build AMAX’s brand as a global technology leader. By targeting breakout technologies and products in the datacenter, Big Data, and high performance arenas, Julia is bringing cutting-edge solutions to market. Founded in 1979, AMAX specializes in engineering and manufacturing advanced Cluster, Server, and Storage Solutions. Headquartered in Fremont, California, AMAX globally operates ISO:9001/14001/ TL9000 certified and UL approved facilities throughout North America and China to service the US, Canadian, LTAM, APAC, and EMEA regions. AMAX's expertise drives two key divisions that deliver customized computing solutions to a wide range of industries: AMAX's Appliance Manufacturing Division provides efficient and top-of-the-line manufacturing solutions and global logistics to OEM customers, while its Enterprise & High Performance Computing Division provides innovative and scalable cluster, server, and storage products developed for HPC, Cloud, Virtualization, and Big Data applications.